Howard & Sons pyrotechnicians, designers and representatives are always available to assist in the arrangement, management and production of your special effect and fireworks displays. Shayne Lewis, our Western Australia fireworks company representative, will help and advise with the design and choreography of your event special effects, before bringing down the professional team closest to you to produce and present stunning night-sky art. Specialising in larger events, but also available for smaller affairs, Howard & Sons pyrotechnicians can bring an arena, stage, park, harbour, hilltop or even community centre to life anywhere in the huge state of Western Australia. 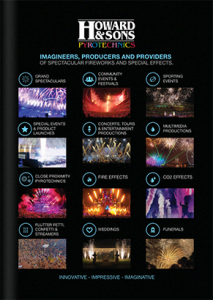 From Perth to the borders of Northern Territory and South Australia, our specialised pyrotechnics teams, quality equipment and incredible effects make Howard and Sons the obvious choice. If you are looking for experienced and ground-breaking pyrotechnicians for your indoor or outdoor, huge-scale or smaller-scale wedding fireworks display in Western Australia, please contact our Howard & Sons Pyrotechnics Perth representative, Shayne Lewis. The use of fireworks by the general public is banned in Western Australia, except for unrestricted fireworks such as party poppers, Christmas crackers and sparklers. Howard and Sons is a professional and leading fireworks company experienced in the design, manufacture and firing of complex pyrotechnic displays, as well as their storage and transportation. We are fully licenced throughout Australia. Fireworks made by Howard and Sons are fired by their original designers in complete safety. The Lord Mayor of Perth once said “No one does an Australia Day quite like Perth”. This was said on the day Howard & Sons entertained the city with a fantastic fireworks display. She wasn’t wrong. We have presented a huge number of cutting-edge, colourful multimedia displays in this similarly vibrant city with fantastic success. Howard & Sons are specialists in the design of elaborate or simple but effective displays with or without multimedia, lasers, water screens, confetti cannons and any other type of explosive entertainment. Give us a call today and see how our pyrotechnician team will make your event an occasion no one will ever forget.